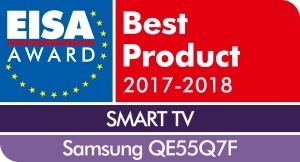 alaTest has collected and analyzed 552 reviews of Samsung 55Q7F (2017) Series. The average rating for this product is 4.7/5, compared to an average rating of 4.3/5 for other products in the same category for all reviews. People are impressed by the durability and sound. The design and usability are also mentioned favorably, whereas there are some less positive comments about the glare and remote control.